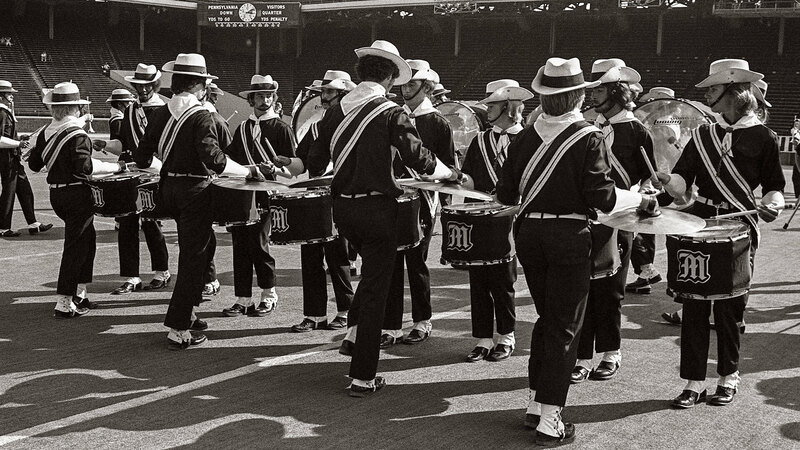 The Drum Corps International World Championships returned for the second consecutive year in 1976 to Franklin Field in Philadelphia. The venue, built in 1895, remains the oldest football stadium in America still in use. Blue Devils won the first of its many DCI championship titles this year, also becoming the first corps in history to win all scoring captions in the Finals competition. Seneca Optimists, Capitol Freelancers, and Guardsmen all earned a top-12 spot for the first time, while the Bridgemen popped back into the Finals after being on the outside for two years. The New Jersey corps’ bright long yellow trench coats and hip demeanor courtesy of program coordinator Bobby Hoffman turned the drum corps activity on its side. The second-place place Madison Scouts valiantly tried defending its 1975 DCI World Championship title by dumping its entire 1976 funk-themed production mid-season, reworking things with music from its show the previous year. When the corps marched onto the football field at the beginning of the season, it was a totally different corps than would be seen in Philadelphia that August. 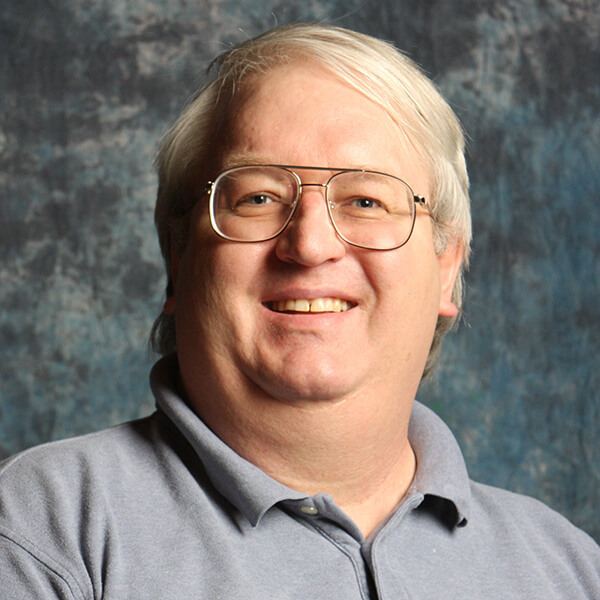 The funk show was courtesy of new program director Fred Sanford, who had previously written for and led the Santa Clara Vanguard drum line to the top of DCI competition. The old show opened with the theme from “Shaft” as performed by Maynard Ferguson and included “Pick Up the Pieces” by the Average White Band. Also included in the discarded show was an original untitled concert standstill production by corps arranger and future DCI Hall of Fame member Ray Baumgardt that opened with a soprano soloist playing what sounded like birdcalls. Corps members simply called it “The Baumgardt Original.” The original ’76 closer was “Mahogany,” the romantic theme from a 1975 film that starred Diana Ross. 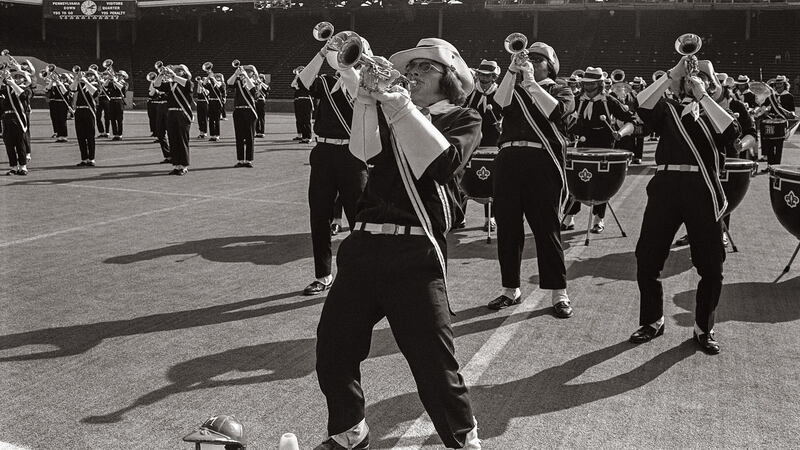 The members of the corps were informed their 1976 repertoire was being scrapped while on tour in California, and they started to learn the new music while still competing with the original. When the corps returned to the Midwest, it cancelled appearances at a number of shows to further learn the revised production. The Scouts weren’t seen in competition from July 4 through August 3. After a few seconds of a silent pause during a company front maneuver, an American flag popped up behind the brass section, resulting in one of the loudest audience reactions in DCI history. At the very end of the selection, five performers re-created the Iwo Jima flag raising that was immortalized in a famous photo from World War II. Today that historic scene is recognized as the sculpture at the Marine Corps War Memorial just outside of Washington D.C.
Moving into the concert standstill portion of their production, the men of Madison played Maynard Ferguson’s rendition of “MacArthur Park.” The piece is based on the Jimmy Webb hit that achieved immortality when actor Richard Harris, fresh off his success starring in the film version of the musical, “Camelot,” decided to record a pop album in 1968. 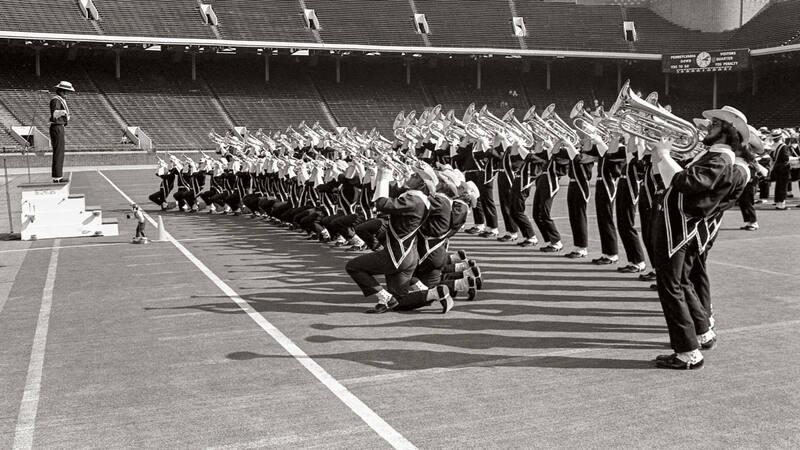 Transitioning to George Gershwin’s “Rhapsody in Blue,” the big sound from the corps as it advanced in a block wedge formation always generated goose bumps in the audience. Closing things out with “The Way We Were,” from the soundtrack of the 1973 romantic drama that starred Barbra Streisand and Robert Redford, Madison formed a double company front that was another hit with audiences. Injecting some additional vigor into the final moments, the corps played a massively loud tag from the big band hit “Ballet in Brass.” That final punctuation mark had been included in each of the three previous Scouts productions.